Change your mind... change your life. This really awful photo was taken in the summer of 2010. As you can see, I was fully immersed in my frumpiness. My reason for posting this terrible photo is to prove to you that even small changes in what you eat, how you dress and how you see yourself can make a lot of difference in your life. After I saw this and the other photos taken on the same day of this woman I hardly recognized, I started making small changes every day. Within three weeks I started to see change. Within six months I had lost almost forty pounds! I stopped thinking of myself as invisible and old which was subconsciously giving me permission to stop caring about how I looked. A positive attitude is so very important. I started going for more walks and eating only fruits, vegetables, seeds, nuts and whole grains. (Read the book "Eat to Live" by Dr. Joel Fuhrman for more information on what to eat and why.) I stopped wearing loose fitting dull clothes. I still weigh 143 pounds at five feet six and a half inches tall. 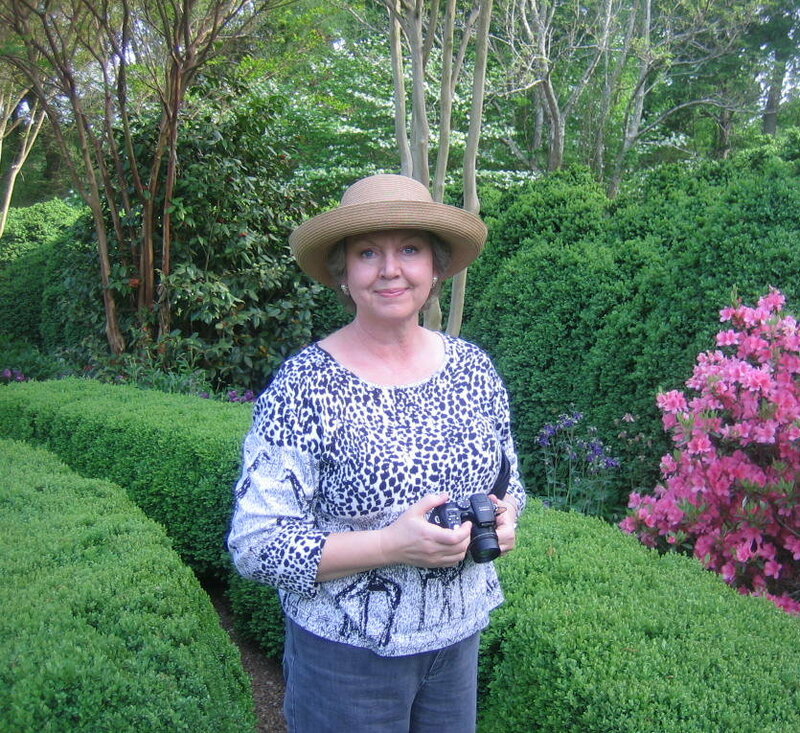 I am 58 years old in the photo above and I am so much happier than I was even in my thirties and forties. I don't do any special exercises, but I do try to go for a walk and sit less each day. I don't eat meat or processed foods. The reason I am sharing all this with you is to be an example. (There are so few of us over fifty gals in advertising.) I want to show you that even small changes in your life can make you much healthier and help you feel better about yourself. I also want to encourage you to go out and enjoy all that life has to offer. My fifties have proven to me that life really does get better. I sincerely hope that you will make a firm commitment to yourself to be the most positive, happy, healthy person you can be. You deserve it! Thank you for joining me and on this journey through midlife and beyond. The second fifty years are truly the best! 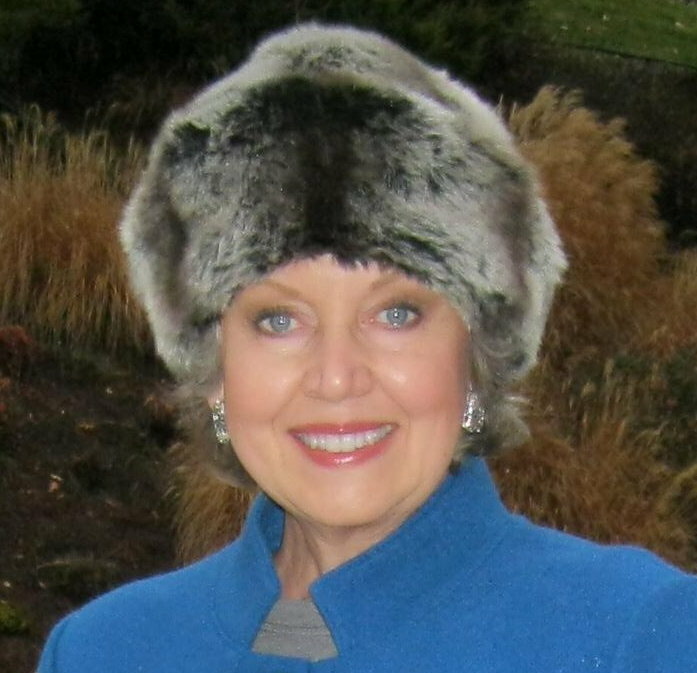 I added a faux fur rain hat to my collection this month. My hair and humidity isn't a pretty combination so there are several hats in my closet. I think this one will be a favorite this winter! Some of my jackets and coats are now too large for me but I will get this one tailored. I love the teal blue color. 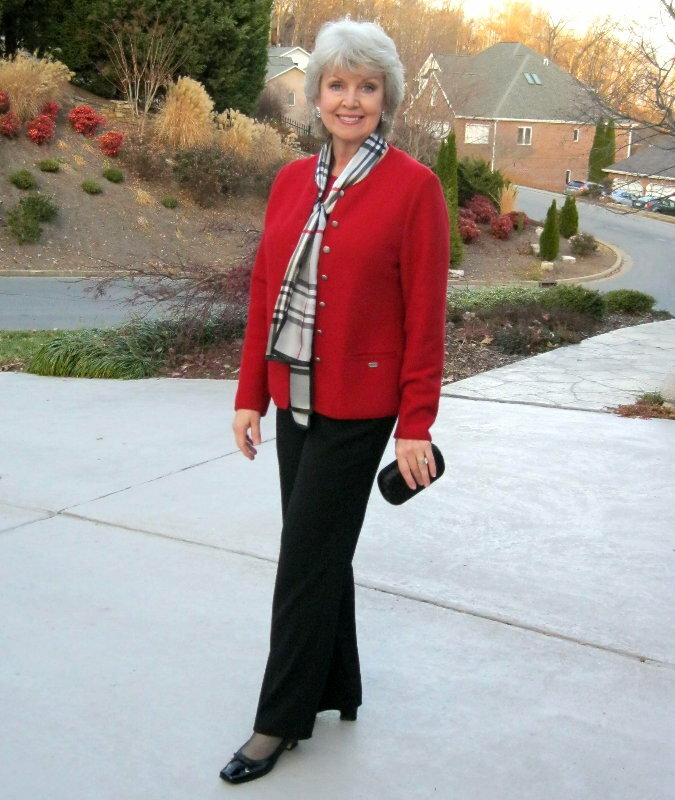 It's a Geiger boiled wool jacket that works great over pants. The scarf is a large square silk(like) material in teal with a bit of animal print from Ross. The bag is a winter favorite by Tiganello from 2011. The pants are a straight leg style from Stein Mart last year. The booties are by Nine West. 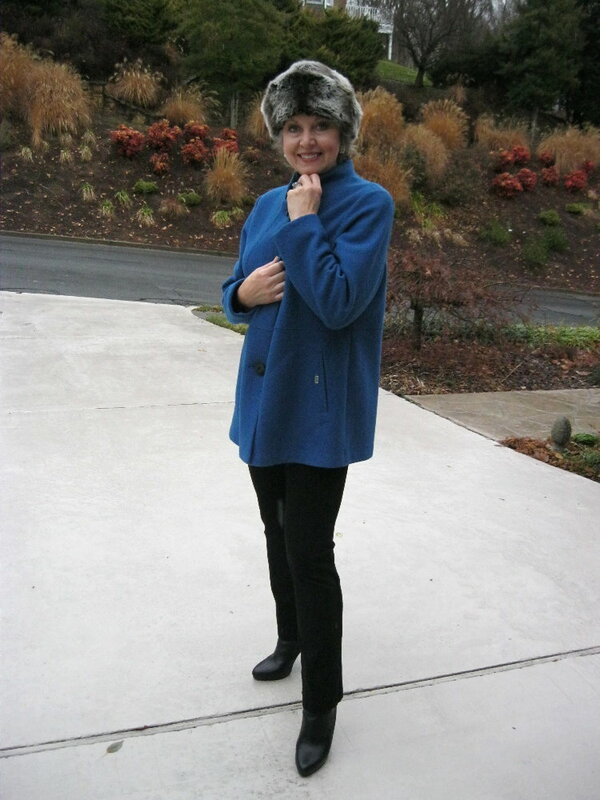 The very warm and comfy faux fur hat is from Coldwater Creek. The grey long sleeved tee is by Vera Wang from Kohl's. 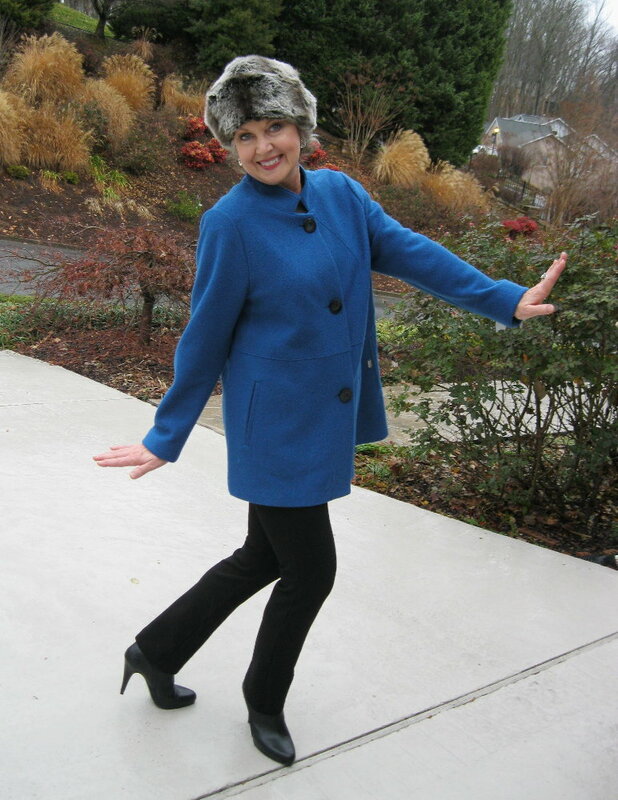 Being silly in the rain brings back sweet memories of my childhood on a farm in North Carolina. The now rare (for me) sound of rain on a tin roof always transports me to that far away simple time. I loved to curl up wrapped in one of my grandmother's hand made quilts on the front porch swing of our old farmhouse and watch the rainfall. When the storm passed I would go looking for frogs and red salamanders. Being an only child at that time and living on a secluded farm meant finding playmates in nature. Thank you for reading my blog and visiting with me on Facebook this past year. Saturday was a beautiful day here! 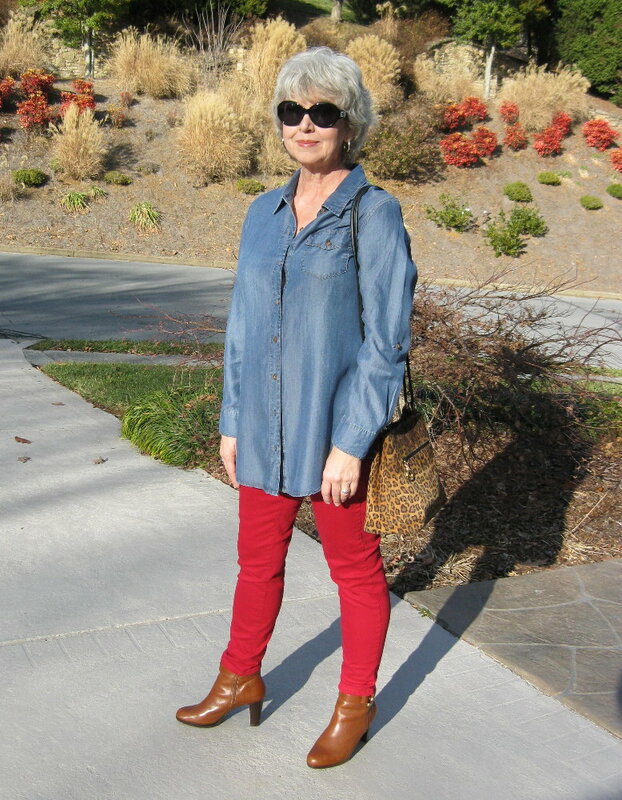 For shopping and running errands I wore red jeggings. Yes me in jeggings! (They are leggings cut like jeans.) I found these at T.J. Maxx. I wore them with Ralph Lauren cognac brown booties (via T.J. Maxx) and a blue Tencel material tunic from Coldwater Creek. The suede animal print bag is more than twenty years old. Proof that if you buy timeless classics they will serve you for many years. I normally do not wear a shoulder bag but this one is a small style that is good for hands free shopping. I purposely kept all my other accessories minimal and in a gold silver combination. The large face watch is from Stein-Mart and the large silver with gold hoops are from B'Dazzled in Blowing Rock North Carolina. Thank you for reading! I hope you have a wonderful Sunday. Do you get tired of eating salads? 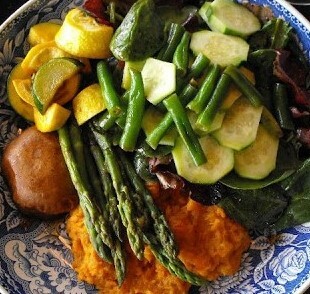 So would I, if limited to just leafy greens but they are among the most nutritious foods we can eat. Leafy baby greens are almost always the largest portion of my lunch or dinner, but I also have steamed, baked, sautéed and fresh raw veggies. Baked sweet potatoes are full of nutrients and a great addition to any meal, but I also enjoy having wild rice, quinoa or other grains. A portobello mushroom cap, zucchini, green beans, asparagus, and squash are also included here. Beans and lentils are an excellent source of protein, and they keep you feeling full for longer. During the summer of 2011, I was facing serious health problems along with numerous possible surgeries. A dear friend suggested I read the book "Eat to Live" by Dr. Joel Fuhrman. By just changing my choices of foods and taking a few walks every week, those health problems have been reversed, and I have lost more than forty pounds. After reading my Power Porridge breakfast recipe, many of you have asked, "What do you eat for the rest of the day?" I have a combination of the pictured salad and vegetables for a late lunch every day with an occasional glass of white wine. Water, almond milk, green tea and white wine are my only beverages. I rarely eat dinner but when I do I try to choose an entree close to this salad and vegetable plate. By adding a variety of vegetables which are currently in season, you will always be able to enjoy an evolving selection of flavors and textures to add to your salads. I like to create a full of flavor veggie stir-fry to serve as the base for my soups and salads. Start by adding some chopped sun-dried tomatoes which packed in olive oil and rosemary to a wide, thick-bottomed sauté pan. Add chopped onions and mushrooms on medium-high heat until the onions start to get tender then add whatever chopped vegetables you want to cook lightly and turn down the heat to medium. Add chopped garlic near the end of the cooking time to keep it from becoming bitter. The combination can be used as a seasoning base for cooking vegetables or making soup. I use some unsalted vegetable stock instead of oils to keep stir-fry from sticking. When the sautéed items are tender, I spread them on a beautiful plate to cool while I am cutting up the fresh vegetables such as cucumber, tomato, celery and sweet red pepper. I use organic baby greens which have been triple washed and layer them over the cooled sauté. I top the salad with the fresh chopped veggies. Notice that I do not use any dressing, cheese, bread, croutons, or crackers. I add a little aged balsamic vinegar that is so delicious you might be tempted to drink it. Below: those are cannellini beans and hemp hearts with sunflower seeds atop lightly steamed fresh organic broccoli, frozen organic peas, organic red pepper, sliced avocado and cherry tomatoes all on a bed of organic baby lettuces. I have some variation of this type of meal almost every summer afternoon. For me, being vegan is a healthy way of eating 95% of the time. It isn't some strange religion that I follow obsessively. If I am a guest in a friend's home, and they are serving chicken, I enjoy it along with everyone else. At my next meal, I return to eating plant-based non-processed factory packaged foods. Last night was date night. I tried on about four different looks before I settled upon this one. On those rare occasions when all the elements of an outfit come together as they should, it is a time to celebrate. The jacket has the same charcoal gray background as the pants which have the same tweed like texture. 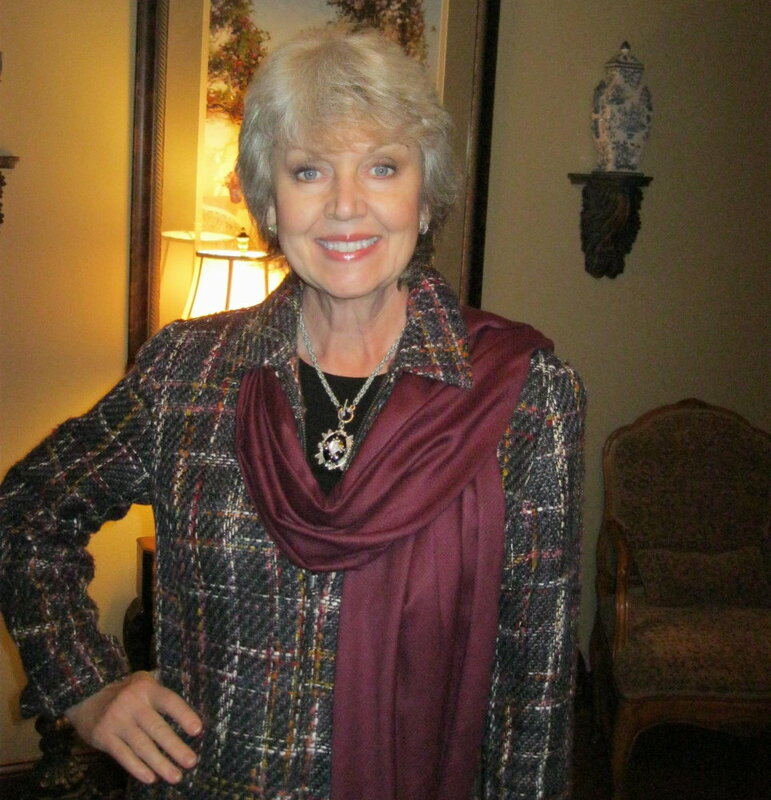 The burgundy scarf picks up the burgundy tones that are woven into the fabric of the jacket. The small simple collar of the jacket is turned up and the scarf is wound around underneath. I'm wearing a necklace of my own design with a long sleeve black tee underneath the jacket. Note that because I have a round face I rarely ever wear a turtleneck. A V-neck top is my first choice when practical. A large portion of the successful look of this outfit is color. I have soft contrast cool summer coloring which means I look best in colors that are dusty rather than intense. The jacket's tailoring is very simple and cut close to the body with a zipper closure. It has small upturned cuffs. The black long sleeved tee is from Chico's. The pants and the jacket are old from Coldwater Creek. The small leather evening bag is from Stein-Mart and the simple black high heeled booties are from Nine West. Thank you for reading! I hope that this post will help you put together a winning look of your own. Last evening we attended the Jonesborough Progressive Dinner, a wonderful holiday ritual for Mickey and I. The event takes place in the oldest town in Tennessee which is only about eight miles from my home. We take a tour of several historic homes throughout the town and have one course of the meal at each home. There is live music and the owners are there to tell us about the history and architecture of the home. Along the route one of the Historians is on board the bus to tell us about the building we are about to visit and it's relation to the history of the town. Knowing that we would be going in and out of the weather and in a variety of settings I opted for layers which could be peeled off as necessary. 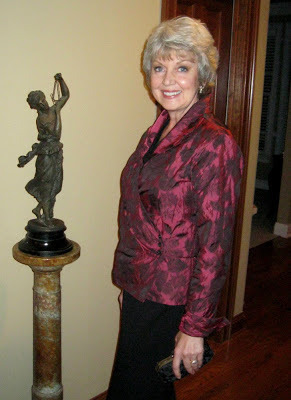 During the small amount of time I had to get dressed for the event, not one but two dear friends called! Friends always take priority so of course I chatted with them while getting dressed which means I had a total of three minutes to actually think about what I was wearing before Mickey arrived. This thrown together at the last minute look carried me through the evening but it isn't a winner in my eyes. Let's talk about why. 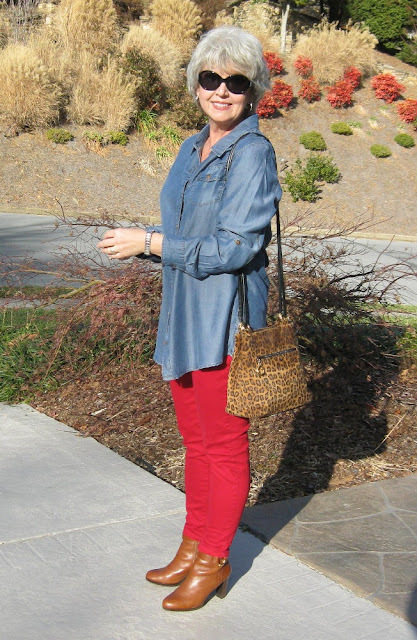 The pants are from Chico's and the red long sleeve tee is also. The jacket is from Geiger. The shoes are from Ros Hommerson (similar here). 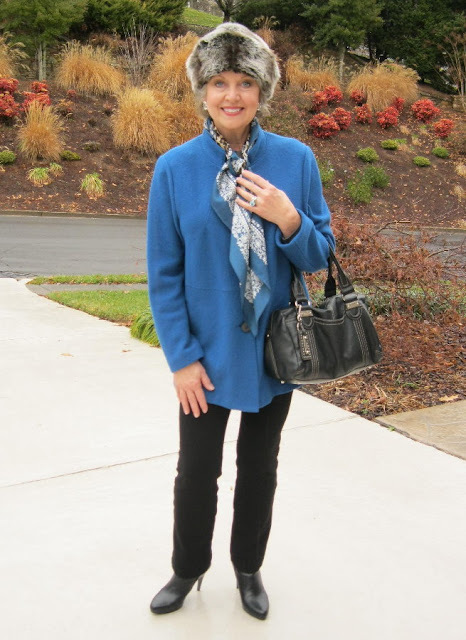 The scarf is something I picked up at Ross and the evening bag is from T. J. Maxx. Thank you for reading. I hope you have a great week! Come as you are... Really? Our society has become so very casual that we now see grown women at the Post Office in pajamas and fuzzy slippers. Would you really want to run into your boss, your potential client or your high school rival in your pajamas in a public place? It takes only three minutes to get dressed for running an errand if you have a couple of planned outfits hanging in your closet together and ready to slip into. You will be glad you took the extra minutes to put on actual clothes when you have to look someone in the eye and speak to them whether you know them or not. You say you are more comfortable in jeans and a tee? These three looks are built around jeans and a tee. The sources for all these products can be found at my Polyvore page. You can look really nice and well put together no matter what you feel most comfortable in. As our American Thanksgiving holiday approaches I am so grateful for the chance we have had to get to know each other over the past year. I look forward to sharing more with you in the coming years! The confident well dressed woman understands that her core wardrobe will serve her well for years to come if she invests in quality, classics and colors that complement her own coloring. She updates her look with a few trending items each season to stay current. She does not feel the need to dress in all the trends of the moment from head to toe. Dressing in too many trends at once actually makes you look older and as if you are trying too hard. Rather than sporting a color blocked peplum top with skinny jeans, an animal print bag and platform shoes try adding a colorful animal print scarf and red flats to update your look. It's a subtle way to say "I know the current style but I also know who I am." 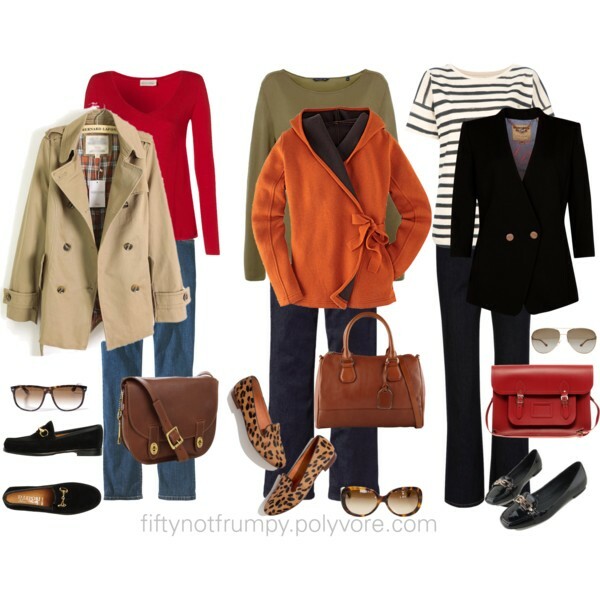 You may shop for the items pictured here on my Polyvore page. Thank you for your kind comments on my last blog post! Last evening I walked the red carpet with Mr. Mickey by my side. The cameras were flashing and there was an adoring crowd. OK it wasn't THAT red carpet but it was fun! We attended the 'Spirits of the Season' gala for the American Cancer Society after which we attended the November performance of the Johnson City Symphony Orchestra. The evening's events gave me the opportunity to view all ages and sizes of ladies in their evening finery. Please remember that if it isn't appropriate for your age and body shape or size during the day it doesn't magically become so after dark. I saw dresses that were too small, too short, too plunging and too shiny for the women who chose to wear them. There were ladies who seemed to be wearing every single piece of bling they owned and if that wasn't enough they also wore glittery eye shadow. Oh my! It was difficult to maintain my composure at times. Many of my friends who attend these functions on a regular basis were also at both events. I noticed that there was a common thread uniting all of us. We were dressed in attire that was devoid of excess glitter, extra bling or plunging necklines. There wasn't a bare back or arm among us. I dare say none of us rushed down to local Pageant Boutique to by a special dress for this event. We looked attractive, comfortable and appropriate for any evening event. Dressing well includes being comfortable. If you look silly in your skin tight satin dress without the benefit of proper foundation garments at home, you will not look better when you get to the event. I strongly believe that you should be able to combine the clothes you already own to make them work for any occasion. You have seen some elements of my recent looks before, which proves I make investments in clothes and shoes which can be worn many times in different combinations to make them earn their worth. Your attire at any event should reflect a woman who is confident, well dressed and comfortable in her own skin. I would prefer to look as if I've been here many times and it's no big deal instead of "I'm wearing my daughter's slinky prom dress with four inch heels I can't walk in. Don't I look ridiculous?" You may also be attending parties and special black tie events this season so remember these tips when you do. Be comfortable. Maintain your dignity. Be true to yourself. Look special and elegant. Have fun! Friday is always date night for us. We get dressed up and visit our favorite gourmet restaurant. Even if we just share an appetizer and have a glass of wine, it is a ritual that we both enjoy very much. It is our time to relax and share the events of the week, our hopes and dreams. One must always have dreams! 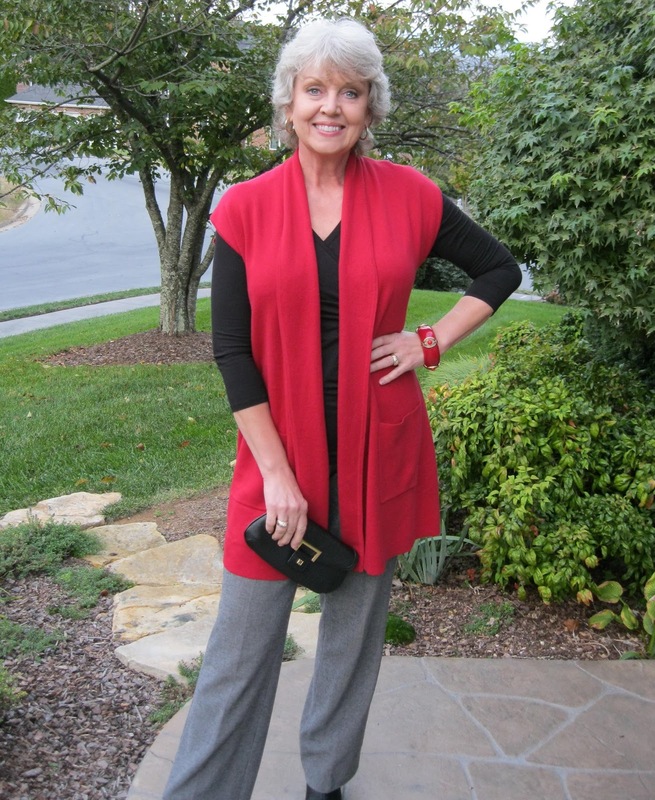 This week I wore a jacket I bought earlier this year from the half off sale rack of swanky boutique in Asheville. It is now too big for me but I layer it with a tank to still make it work. Here I'm wearing it with wider leg black crepe trousers and a black tank with a draping neckline which is a bit dressier than a form fitting one. My stylist gave me a great wash and go cut today. Thank you Allison! I am not one to spend any time on my hair so it will always be a simple let it be style for me. Thank you for reading. I hope you have a great weekend! When you are getting dressed, do you ever think ... these earrings go great with these shoes? It's so true! Shoes and earrings are related. All the components of your outfit make a small statement that add up to the total look and tell your story for the day. Jewelry tells a story for me because I was a designer for so many years. I went on market trips to NY and Atlanta with boutique owners so that I could start creating appropriate jewelry for the lines they were buying long before they arrived in the stores. Accessories that are not so much matching but complementing in color and attitude complete a look. Think about the attitude of the pieces you are putting together. For example the navy strappy sandals say evening wear as do the navy drop earrings. The T-Strap suede shoe says fashion forward and a little daring... so do the suede hoop earrings. Accessories from head to toe should speak the same language. I hope that the hurricane has now passed and that you and your loved ones are safe. The weather was unseasonably warm for late October so my outfit for date night included light weight layers and black sandals. The long sleeve black tee is from Chico's. 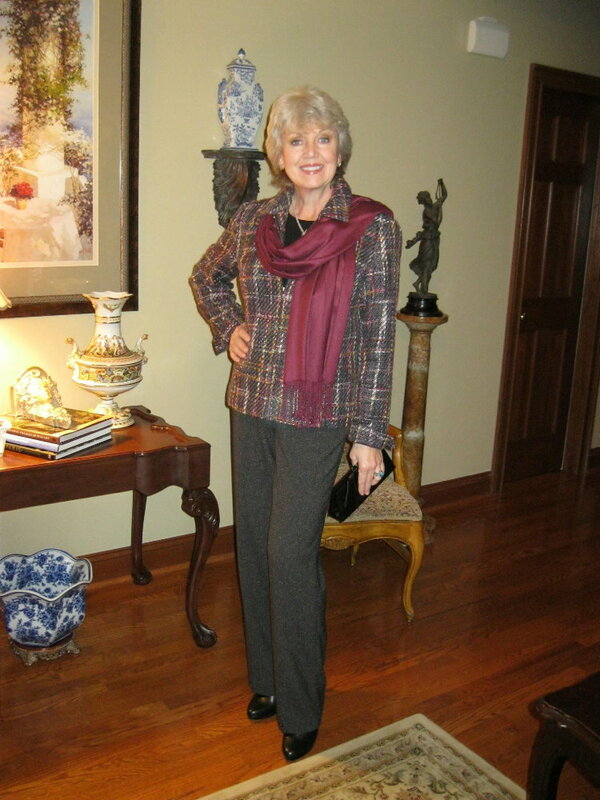 The pants are by Anne Klein in a wonderfully smooth heavy knit fabric from my fabulous haul at Ross yesterday. 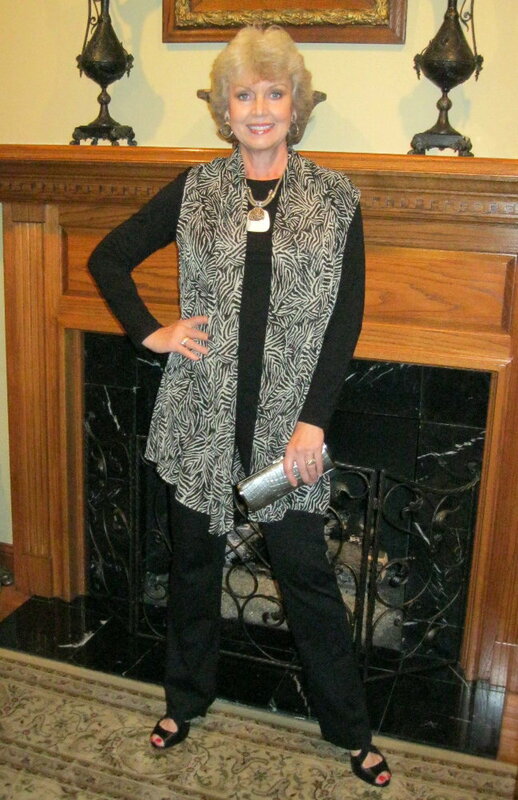 The animal print flowing sheer fabric long vest is from Coldwater Creek. I love these vests as a third element. They can be worn as a scarf, a wrap or a vest and will serve as a year round accessory. I've found them at Chico's and Coldwater Creek in several color combinations. The necklace is by Erica Lyons from Belk. The black sandals are from Stein Mart and the pewter clutch is by Kenneth Cole Reaction via T.J. Maxx. Thanks for reading! I hope the rest of your week is fabulous. Do you have a formula for the way you dress? Long ago I realized that if I wore smooth flowing fabrics in a soft palette of colors I would be able to layer items or combine them in different ways to create outfits for many occasions. My closet includes basic pieces that can be worn with different accessories to elevate them from daytime work wear to elegant evenings with friends. I won't buy a wardrobe of clothes which serve only one purpose (such as evening wear). 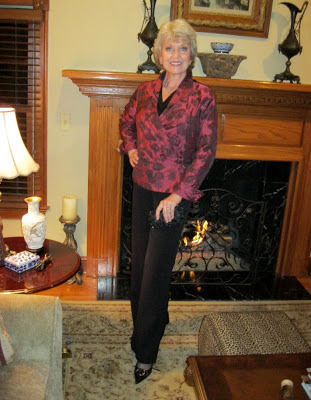 A silk blouse I might wear with jeans to run errands during the day can also be worn with a black pencil skirt or crepe pants for dinner with friends. Accessories are the key that make these combinations work for me. Large scarves, wraps or shawls are a great way to add dramatic color and 'temperature control' as is so often needed at this stage of life. Sunglasses are a daytime staple for me. I never leave without them. Earrings with a button top and dangles or hoops are much more flattering than those little wires that pass through the hole in your ear. A large link bracelet or a stack of bangles (or both!) are great accessories to add to almost any outfit. If I wear a statement necklace, I balance the drama by letting it take center stage and wear minimal other accessories. Structured handbags and clutches are much more flattering than big shoulder bags that make you look lopsided and sloppy. Interesting but comfortable shoes are a must! Life is way too short to wear boring shoes. This is my formula for shopping and getting dressed everyday. I have soft contrast coloring and a subdued quite personality. These tips serve me well and have helped me get ready for any event for most of my adult life. If you have high contrast coloring such as dark brown eyes with an olive skin-tone and dark silver gray hair and a bold outgoing personality your formula would be very different from mine. I hope that sharing my concept of a "Formula" for dressing will help you put together easy, fabulous outfits so that you can get busy enjoying life. If you would like to shop for the exact pieces I use in my fashion sets here and on my Facebook page you may visit my Polyvore page. Thank you for reading! I hope you have a great weekend! You may have heard the saying, "You must know the rules in order to break them effectively." With my soft contrast cool coloring, I should not wear brown or warm animal prints... but I love both! 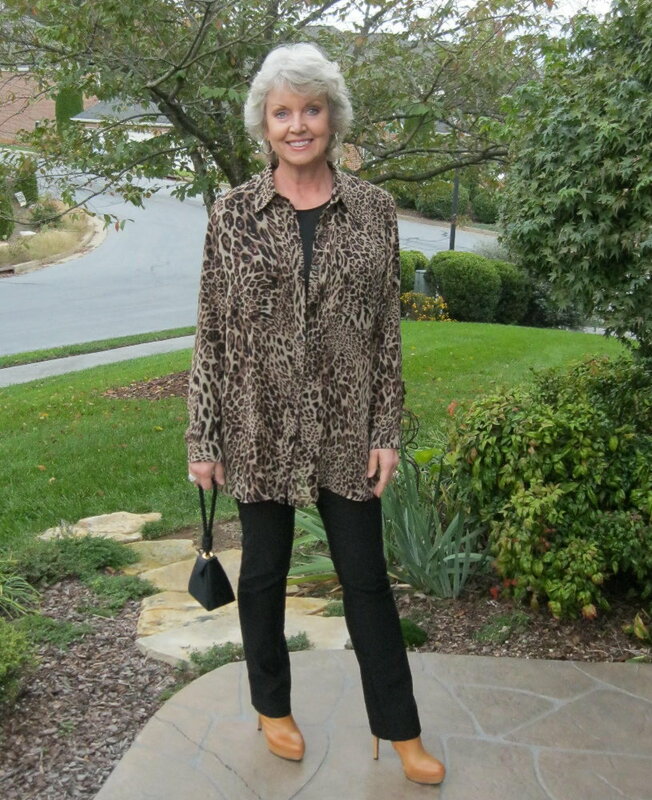 Last night for date night I wore an animal print tunic from Chico's Traveler's Collection. I layered it over a sleek long sleeve tee with spandex and Lycra, also from Chico's last year. The slim black pants are from Stein-Mart last year. The high heeled booties are by Vince Camuto and they are from Nordstrom. 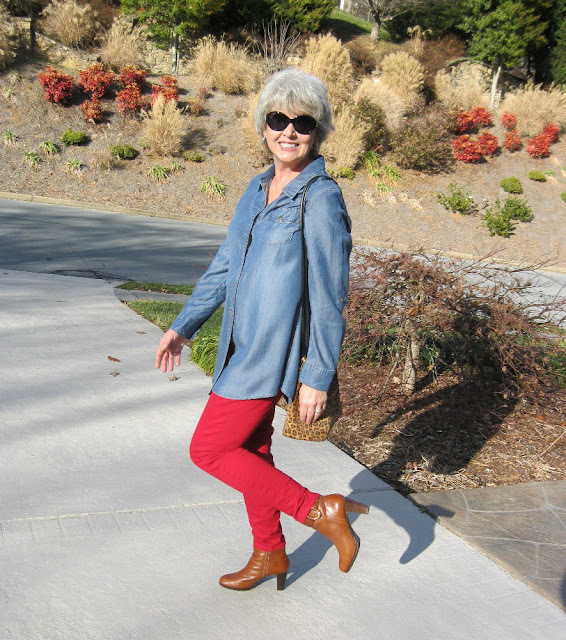 In spite of their high heels, these booties are comfortable and easy to walk in. The little evening purse is one of my favorites but it must be fifteen years old. The silver and clear rhinestone hoops add a touch of cool tones next to my face. The tunic is a little too large but I would prefer anything which buttons to not fit too tightly across my bust. I often go up a size in tops for that reason. I will also be able to wear this light weight tunic over summer clothes with the sleeves turned up. Thanks for reading. I hope the rest of your week is wonderful! I love the look of chunky booties with tights and a pencil skirt for daytime in the cooler months. When the proportions are right for you and the skirt isn't too short you can still turn heads in a good way. 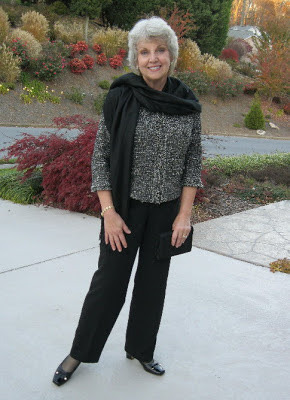 Here I've paired a graphite skirt with a loose fitting graphite long sleeve tee and a scarf. The scarf brings in the other colors to add. Burgundy is the color for us! It's very flattering to the face and can be worn with all the neutrals so well. Add a few gold tone bold accessories and you can seize the day. If you would like to shop for the exact items I've shown here you can visit my Polyvore page where I create wardrobe and outfit ideas. I normally list only items that are less than $100. I don't shop for high end expensive items but I do want to look current and attractive. Those are the tips I share with you here and on Facebook . Thanks so much for reading! I hope you have a wonderful day. Many of you have written to ask for tips on makeup and hairstyles that respect our changing faces. I am sharing my step by step routine with you here. Permanent makeup, fillers, and plastic surgery are not options I am considering. I don't mind the character and expression lines that my face has developed over the years. I firmly believe that healthy eating, lots of water and regular exercise are the best beauty routines one can follow. After fifty, some things became easier and for me, a hairstyle definitely falls into that category. I stopped coloring my hair after my fiftieth birthday and found a great stylist who gives me a softly layered angled bob cut that frames and slims my roundish face. Ask your stylist for a cut that works with the natural tendency of your hair and one that complements the shape of your face. A good stylist will also consider if your style is complementary to the size and shape of your body. For example, a petite woman peering out from a huge bush of long hair is not in balance with her proportions. In the photo above I have just returned from my stylist. She gives me low lights about twice a year which keep my hair from appearing to colorless and dull. The chrome glaze she adds every five weeks gives it a nice shine. As for styling products, I don't use anything but a gentle sulfate-free shampoo about three times a week. I sometimes just rinse my hair in the shower and then reshape it for the day, but skip the products entirely on most days. My thinning hair and dry scalp do not respond well to most products. A build up of styling products adds too much weight making my hair flat. It also gets trimmed about every five or six weeks. I don't allow my hair to get too long or get it cut too short. Both extremes add years to my face. Warm water and a gentle skin cleanser remove makeup in the evening. Liquid Neutrogena in the pump bottle is my choice for a cleanser. I splash some warm water on my face to rinse it and then pat dry. I find that eye creams add puffiness and night time moisturizers cause me to break out so I skip those. One of my all time favorite moisturizers for my whole body is Coconut Oil. My makeup routine has also been streamlined. In winter, I use a heavier moisturizer but in summer, I use only a tinted moisturizer or very light foundation that is appropriate for the texture of my skin. I apply the foundation mostly in my T-zone. (The T-Zone is the center of your face from your forehead down to your chin where most of us were a bit oily when our hormones were plentiful.) Use a small makeup sponge or brush to blend gently away from your nose and skip the area around your mouth so that you don't emphasize lines. This technique of starting your makeup in the center of your face and blending away helps to avoid the dreaded line of demarcation where your makeup stops and your neck begins. Here is a blog post including a makeup video. I use makeup brushes rather than sponge applicators. They allow for better blending and less tugging on the skin. I use a liquid eyeliner applied into and under the base of my upper eyelashes (on the waterline). I don't apply liner or mascara to my lower lashes because this looks very harsh on me. My eyeshadow is always the same in varying degrees of depth of color for the day versus evening. The palate includes soft beige, a very pale shell pink, gray and rosy browns that complement my cool skin tone. I start with the darkest brown in my lash line and just above it. In the crease of my eye and just above it I blend a medium brown. I blend the lighter colors up to my brow and then blend. For more definition and drama, I add a smoky gray color at the outside corner of my eye. I use a blonde eyebrow pencil to fill in my thin brows, but I'm careful to blend and brush that out as well. I use a brown/black mascara and that's it for eyes. I brush on a bit of blush in a rose tone high on the cheekbones, the bridge of my nose and under my chin. If your skin is very dry cream blush might be best for you. Once again blend, blend, blend! Note: Do not smile and put blush on the apple of your cheek as we were taught when we were younger. When you stop smiling the blush will be lower than you want and not have the effect you want at all. I apply a lip liner over my whole lip and then a very similar color of lipstick. After blotting, I'm finished with my daytime makeup routine. During the evening, I may wear a brighter lip color but I apply and blot it several times while I am applying my make up so that it stains my lips rather than sliding around on top. I will use a similar color lip balm to touch up during the evening. I almost always wear sunglasses when I'm outdoors and if I will be in the sun for more than a few minutes I also wear a hat. Skin cancer is no fun and I hope to never have it again. I hope these tips prove to be helpful to you. Confidence looks good on you! Celebrating our fiftieth birthday often means a rounder body is the gift we receive. Hormones and lifestyle play a part in this new body shape but we still want to look nice and dress in a way that is both flattering and comfortable. I've been a larger woman for most of my life so these tips are ones that I have always used to conceal a tummy that will never be flat no matter how much weight I lose. 1. Wear a top and pants or skirt in a similar color. 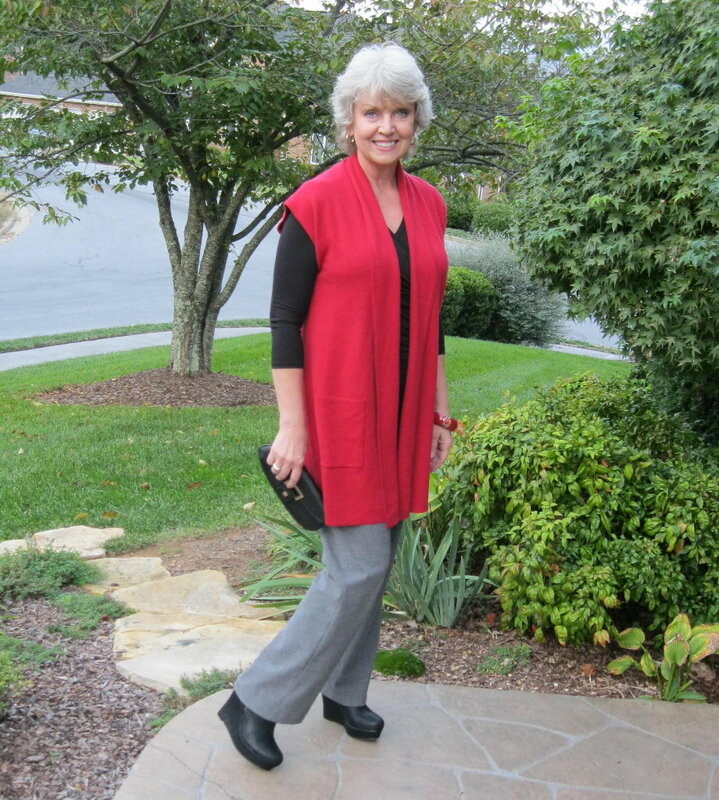 Always wear a scarf, an open jacket, a blouse or a sweater in a different color to add a vertical line. The top should never be tucked in. If it stops just below your tummy that's a very good thing. Look for pieces that have smooth finishes that flow across your body rather than clinging to it. Avoid anything quilted or bulky. Pants and skirts should fall from the widest part of your body. If your thighs are that point, pants should skim your body to that point and then flow smoothly from there. Skirts should end at the slimmest part of your leg which is normally just below the knee. Pants should stop at the bottom of your heel. If you wear Capri pants, always wear a platform wedge shoe with them to lengthen your leg. 2. Look for silky smooth scarves in oblong shapes. The idea is to add a nice long vertical line, not bulk. Don't tie the scarf around your neck so that it ends with even tails in front. Try tucking it under the collar of your jacket so that one end is shorter than the other. Avoid horizontal lines of any type across your body. If the scarf is long enough try looping it over itself to create a V below your bust. A V shape neckline is usually more flattering than a round one. 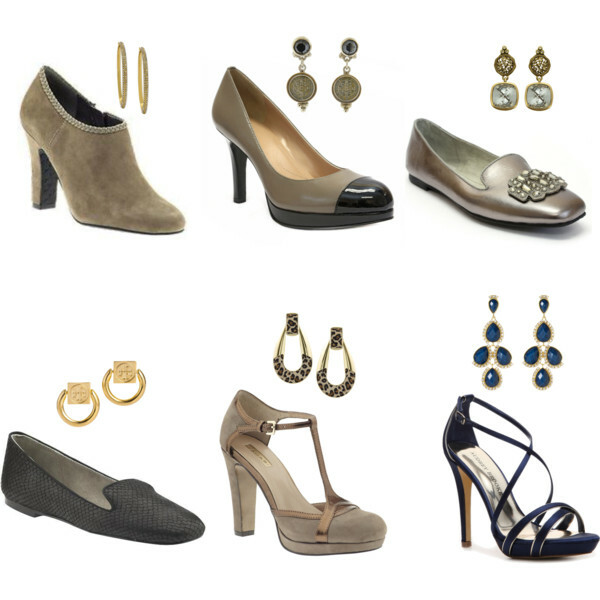 3.Try to always wear a thicker, low heel rather than a totally flat shoe. Carry a bag that isn't too small or puffy. A sleek and structured bag looks much neater and doesn't add width to your silhouette. Be cautious with shoulder bags that hang right there beside your hips giving you more width where you least want it. 4. Wear the biggest clip on earrings you can get away with. Earrings with strands or movement are a great friend to us. Never wear a pointless little button stud earring that barely covers the hole in your ear. Hold your head up high and smile. Confidence is your best accessory! When the evenings start to turn cooler, I find that a long sweater vest is the extra layer that works for me. This one is from Chico's. It's a soft tone of blue red that isn't too bright. I've paired it with a crossover tee in black and tailored gray slacks. When I want try something trendy like these fun wedge boots in black I look for a cute inexpensive option. I found these at Target. Mickey was taking me out to dinner so I switched to a small black and gold leather clutch bag. I'm wearing a red bangle with gold medallion details and gold with silver hoops. Thanks for reading. I hope you have a great rest of the week!